A highly perturbed family has made a shocking claim about a doll which has terrorized them for many years. 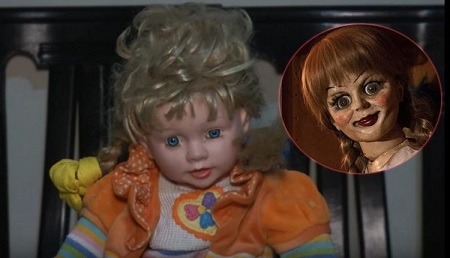 A seemingly harmless doll has been dubbed the “Peruvian Annabelle” after the family that owns it claimed that they have been terrorized by it for the last seven years, Oddity Central reports. In a YouTube video that recently went viral, the Nunez family, in Callao, Peru, explain that they have witnessed various paranormal events connected to “Sarita”, a blonde, blue-eyed doll that they received seven years ago. Mother-of-three Ivonne Nunez said that it was a gift from a niece that has since died, and even though strange things started happening soon after the girl passed away, she just couldn’t bring herself to throw away the doll. It’s the last thing reminding her of her niece and sister-in-law, the latter of which reportedly took her own life in the same house they live in today. The doll, which plays a recording of “Our Father” when a button on her chest is pressed, apparently starts praying without anyone touching it, but that is the least bizarre thing about it. According to Oddity Central, the Nunez family claims that they put Sarita in her corner before going to sleep, but sometimes find her on the table, or the couch, and their three children often wake up with scratches and bruises on their bodies that they are certain are caused by the possessed doll. 20-year-old Angie Nunez said that she sometimes hears noises in the house, feels a strange presence in the corner of her room and sees shadows moving in the dark. “Every night I feel as though somebody is looking at me from the corner of the room”, she said. Both Angie and her two brothers would like nothing more than to get rid of the doll, but her mother doesn’t want to part with it. Instead, she decided to enlist the service of a so-called “angelologist” (an expert on angels) to drive away the spirit possessing Sarita. The aptly-named Soraya de Los Angeles conducted a ritual to clean the house of the Nunez family, and reported that she felt the presence of a woman, who Ivonne suspects may be her sister-in-law, who died in one of the rooms. After inspecting the doll, the angelologist said that she felt an evil entity that aims to harm the family. She tried to make the spirits leave with a statue of Saint Michael and seven large burning candles. It’s unclear if her attempt was successful, so it’s fair to say that the Nunez family is even more spooked out than before. Maybe they should have gone with these teenage demon hunters instead.